La Mesa Verde (The Green Table), a leadership network of urban gardeners who create access to healthy food, is a program of San Jose's Sacred Heart Community Service. The UC Master Gardener program is collaborating with Sacred Heart Community Service providing bilingual gardening courses for new home gardeners, visiting families at their home to offer individualized training & support and growing quality unique seedlings for La Mesa Verde to purchase at a reduced rate for families in the program. Since the founding in August 2009, over 450 families have been provided with garden beds and over 100 families are currently active in the program and volunteering to give back to La Mesa Verde. UC Master Gardeners visit prospective families at their home to ensure they have the growing conditions for a vegetable bed to thrive. 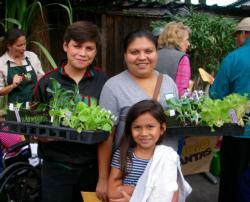 Every spring and fall, families come to Sacred Heart to receive their vegetable starts and seeds. 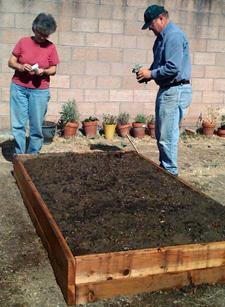 UC Master Gardeners conduct demonstrations and training on how to plant the vegetables. In Spring of 2014, four demonstration beds were constructed at Sacred Heart which facilitates our training and education for the families The vegetables planted included lettuce, peas, chard, broccoli, cabbage, cauliflower, spinach, onions, garlic, and cilantro. UC Master Gardeners have continued to advise the families, answering questions and offering guidance as needed. 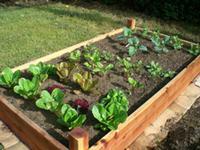 UC Master Gardeners provide ongoing classes on vegetable gardening covering topics such as soil health, taking care of your seedling, warm & cool season vegetables, beneficial insects and Integrated Pest Management (IPM). Member families who have completed the program give back by volunteering on build teams, teaching cooking classes and mentoring new families in the program, making La Mesa Verde a true community effort. La Mesa Verde welcomes assistance from the public. To donate or volunteer for La Mesa Verde, contact Shreya Condamoor or call her at 408-916-5024 or call Sacred Heart Community Services at 408-278-2171.